There are few things more terrifying on a computer than realising that you’ve lost or deleted precious data. It’s even worse if that data is on an SD memory card that has photos from a special occasion or holiday, or video of a once in a lifetime event like a wedding. Fortunately, even when all seems lost and the SD card can’t be read on your Mac or it looks like there are no files on it, there is hope. 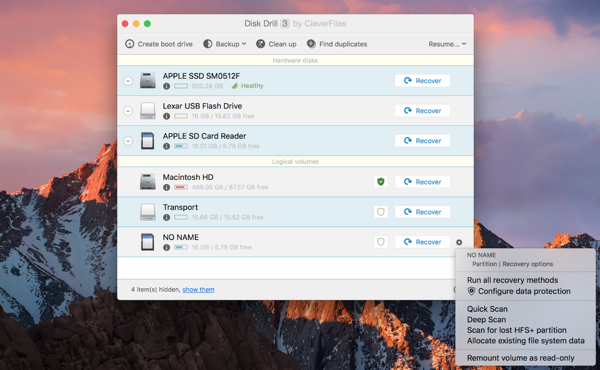 Disk Drill can fix the card and recover lost data. The most important thing to be aware of is that you should stop using the SD card as soon as you realise you’ve deleted data or that it has become corrupt. That’s because most cameras don’t wipe data completely – they only alter the file structure to make space available for new data. If you stop using the card immediately, the data won’t be over-written, but if you continue to use the card, there’s a good chance it will be wiped completely. The more you use the card, the more chance there is your data will be over-written and you won’t be able to recover it. So, stop using it as soon as you realise there’s a problem. You can restore your files, but you need a special program for this. When your SD card is corrupted or damaged, your data will usually become inaccessible. The good news is that Disk can scan a memory card and recover files in the most common situations when SD card data get lost. It’s best if you have Disk Drill installed before you lose data, as a precaution. That’s because it has two features, Recovery Vault and Guaranteed Recovery that make it much more likely you’ll be able to recover data when its deleted. Most of us don’t take such precautions, however, so launch Setapp, search for Disk Drill and click Install. If your Mac has an SD card slot, insert the card. If not, connect a USB card reader to your Mac, and insert the card into that. The memory card should mount in your Mac’s Finder. 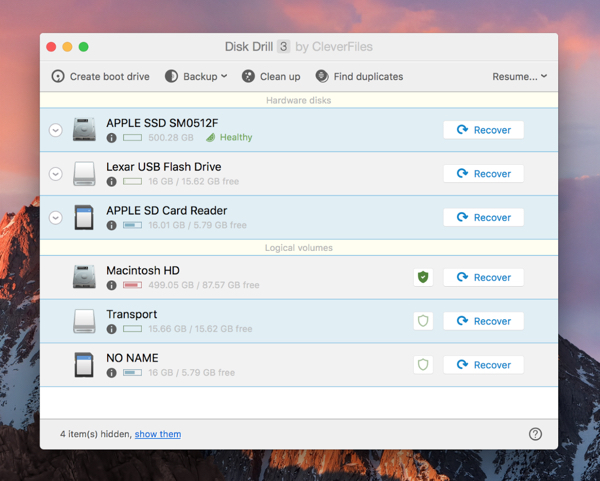 If it doesn’t, launch Disk Utility, click on the SD card in the sidebar and click Mount. Run Disk Drill and wait for its main window to open. You should see your SD card listed in the window. The simplest way to recover data is just to click the Recover button next to the name of the card. This will run through the different scanning methods and attempt to present a list of deleted files. If you’d rather have more control, click the cog icon next to the Recover button and choose either Quick Scan or Deep Scan. Quick Scan, as it’s name suggests, is the quicker method but is more superficial and only works on specific storage formats and won’t work if the card is corrupted. Deep Scan takes longer but goes much deeper into the card’s file structure, works with more file formats, and is more likely to work if the card is corrupted. Once the scan is complete, DiskDrill will display a list of the files it has found, along with the file type (photo, text, movie and so on), its size and its modification date. If it has found lots of files, you can filter them so you only see files of certain type, a certain size or which were deleted within a time you specify. To filter the results, click on a menu, for example the one that displays ‘All files’ and choose an item from the menu, for example JPEG image. When you do that, Disk Drill will only display files of that type, making it easier to find specific files. Be aware that, depending on how damaged the files are, all the information may not be correct for every file. DiskDrill saves sessions automatically so you can come back later, but it’s a good idea to manually save a session at this stage, just to make sure. Click the Save session button in the tool bar. Now, if you quit Disk Drill and come back later, you’ll be able load the session and pick up where you left off. All the details of the scan you’ve just done will be saved. When you see a file you’re looking for, click the eye icon after the file path to preview it. This works a bit like the OS X Quick Look feature, allowing you to see the contents of a file without opening it. That way you can tell if a file is damaged before you attempt to recover it from the SD card. It’s important that you watch movie files all the way through and listen to music files all the way to the end – they might look ok at the beginning but the damage could be anywhere and if you don’t preview the whole file, you might not spot it. Once you’ve previewed the files you want to recover and are happy they are not damaged, tick the check box to the left of their name. 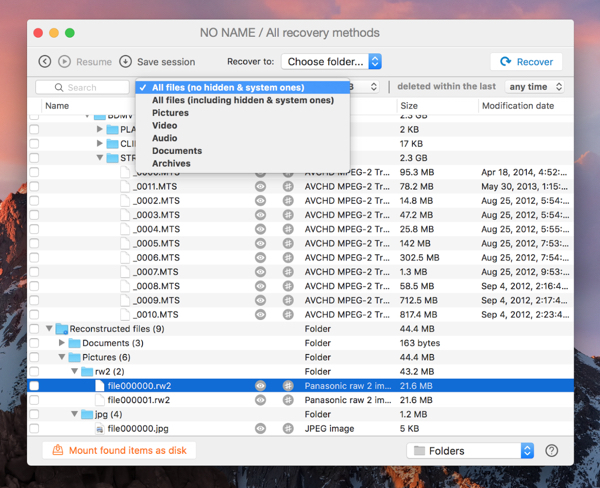 Go through the list previewing and marking each file you want to recover. 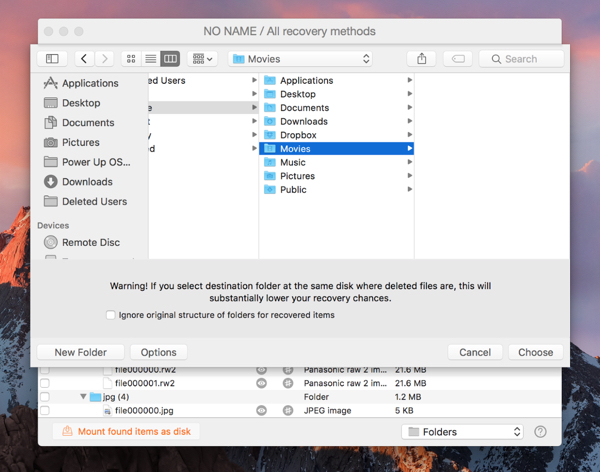 The safest way to avoid having to recover files is to keep at least one backup. So copy the files you’ve just recovered to another drive or cloud storage service to keep them safe.